Tired of foot pain and numb feet from your straps? The AirForm ankle strap conforms to your boot with independent compression pods eliminating pressure points and allowing for pinch-point free flex. Keep your feet happy and boots snug in your bindings while touring and riding. Channel-like stance adjustability for splitboards built with inserts. Believe it. This breakthrough in design has riders beyond stoked , and has made Spark Pucks our most popular splitboard accessory. Looking for a canted option? Check out our Spark Canted Pucks. You want your splitboard to ride more like a solid board. We get it; so do we. Our clever design features a one-piece crossbar that extends from one set of bolts to the other for the stiffest possible connection between the board halves. The cam lever clamps the board together taking gaps out of the board seam. The crossbar and lever rotate out of the way leaving nothing hanging over the edges to snag while you’re touring or getting rad split skiing. Clamping tension is easily fine-tuned by turning a set screw, compensating for any wear or board variability. Spark Crossbar Clips are made from lightweight aluminum in an elegant low profile design, with only two moving parts. As a bonus feature, they can be entirely set up with the M3 hex bit on your Spark tool. Tesla Heel Lockers attach to the Tesla Heel Rest and are easily operated with the tip of a ski pole. 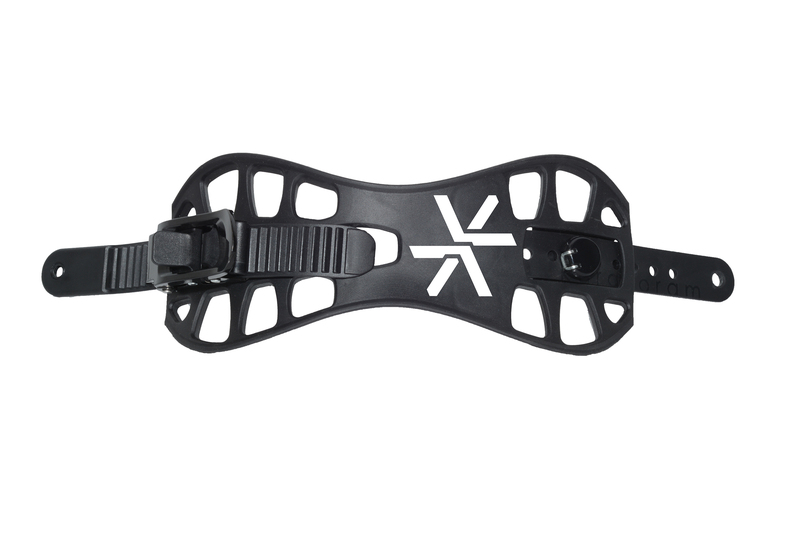 Riders can lock down the heel in tour mode to better adapt to diverse terrain types where quick descents, side-stepping, traversing, and skate-splitting become more effective means of backcountry travel. Impress your friends with your climbing bar deployment steeze. This retrofit climbing wire with a side arm lever (ie: whammy bar, of course) replaces your stock climbing wire for quick change high-to-low-to-stowed action. Use your touring pole to flip the Whammy Bar down for 12°, then down again for 18°. Flip the bar back up to stow. Whammy Bars now come already installed on 17/18 Arc and Surge splitboard bindings and Baseplate Kits. Tour with confidence, even backwards, knowing your skins are securely in place. The revolutionary Spark R&D Tailclips are a retro-fit addition to any skins – all you need is a hammer and scissors to install. Asymmetric clips designed specifically for splitboards are easy to remove and secure keeping skins tensioned parallel to length. 10cm of tool-free adjustment to fit your whole quiver. Either upgrade your single height wires or deck out your new splitboard with these 55mm and 75mm climbing heels. Compatible with pin mount bindings or hardboots used with Dynafit toe pieces. Includes: one pair of dual height climbing heels/wires and screws to mount to an inserted, factory-built splitboard. All the same great features of our Spark Pucks, but with 3° canting for reduced knee strain. Near infinite adjustability for splitboards with inserts. Quick mounting with super fine foot placement, angle, and toe/heel centering adjustments.